Imagine enjoying a week of Scuba Diving in Thailand around Pattaya's Islands. Personally - My friends and I had so much fun on our last scuba diving trip to Pattaya. 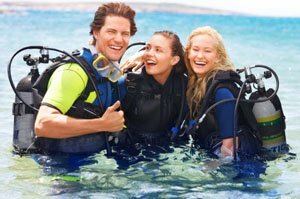 It's fun to meet other scuba divers, from beginners to divers with hundreds of dives under their belt. Pattaya of course offer a really fun Nightlife and it's hard not to party too much so you can get up in the morning to go scuba diving. On the other hand if you're up for something different then I recommend staying in and going to bed earlier. You'll wake up fresh and ready to go to the exclusive party under the sea! But the good thing is the Adventure divers pick you up in the morning and drop you off in the evening at your hotel. All you have to do is show up and get your gear on. Have you ever done scuba diving before? Chances are you'll feel like you're getting geared up to go into space. I know that I sure did! Note: Like the picture? Click here to make it bigger. The Wreck Scuba Diving in Pattaya is supposedly the best in Thailand and it sure was fun. For this trip I brought my own scuba diving equipment but you don't have to bring or buy your own. The Adventure Divers provide everything. All you have to bring is yourself and a bag of fun. 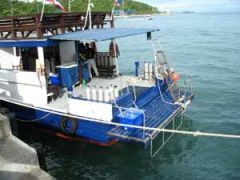 My friend 'Robert' built the boat 'The Saifon' specifically for scuba diving in Pattaya. It's easy to enter the waters and easy to get back on. He named the Boat 'Saifon' which is his Thai wife's name. So when you meet him and ask him much it costs to ride her - mention that you're talking about the boat! 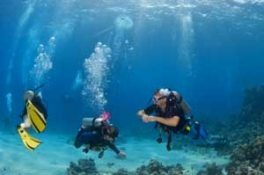 In any case - we went scuba diving around all the islands of Koh Lan, Koh Sac, Koh Khrok, and the 'far islands' of Koh Rin and Koh Phai. The Thai Chef cooked all kinds of great Thai dishes for us and they provided cool drinks and snacks. These Islands are really amazing and sometimes we just went snorkeling. In any case - have fun!